In Triple-A the teams only play 144 games. 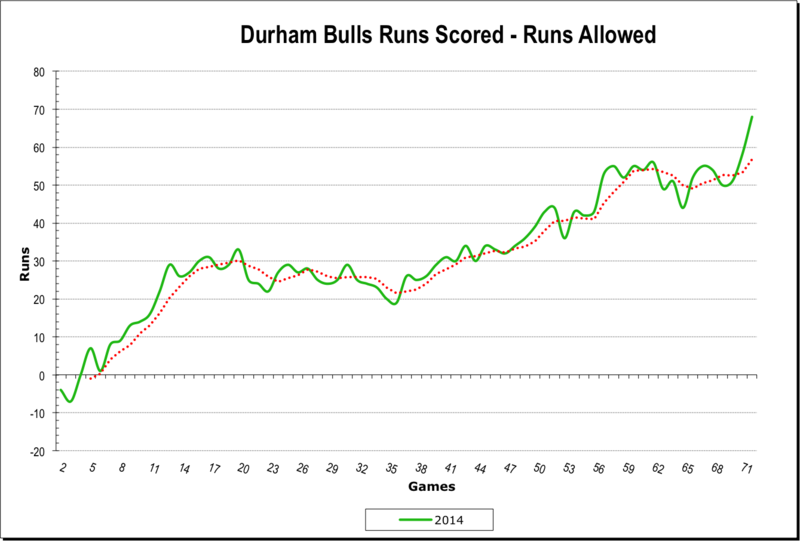 Last night’s 12-2 win over Louisville was a wonderful way to mark the middle of the season for the Durham Bulls. At 43-29 the Bulls have the best record in the International League, are on a 3-game winning streak, and lead the second place team in the South Division (Gwinnett) by 7½ games. 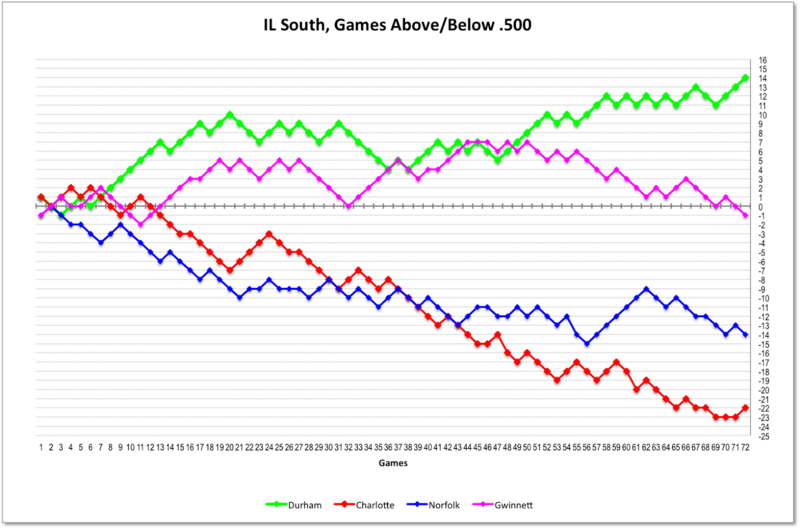 Plotted by games above/below .500, here’s what the South Division looks like. Note: click on any of the charts to get a larger view. We like tracking runs scored minus runs allowed. It creates a graphic that we think tells us something about both pitching and hitting. This also looks nifty to we Bulls fans (as long as the trend (a moving average). 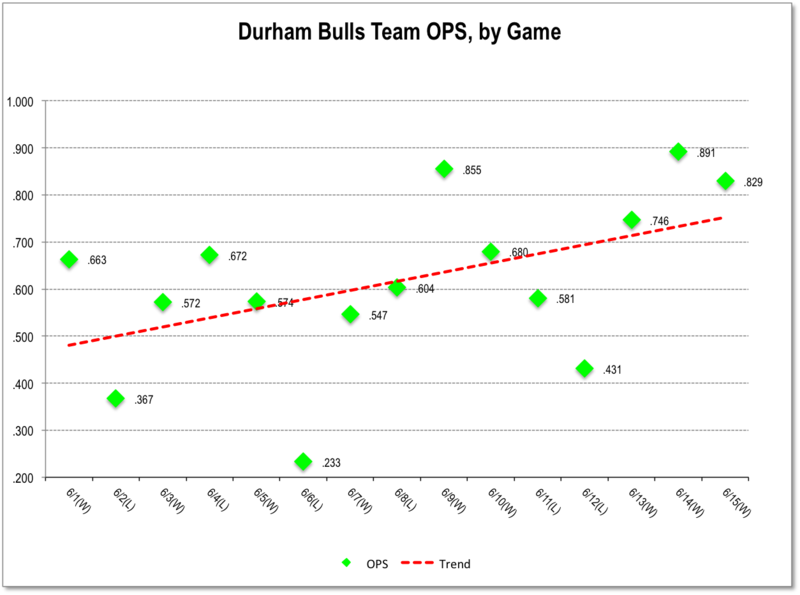 The pitching is, as would be expected, a big part of why the Bulls are where they are. This chart tracks the cumulative ERA of the starters and relievers over the last 15 games. 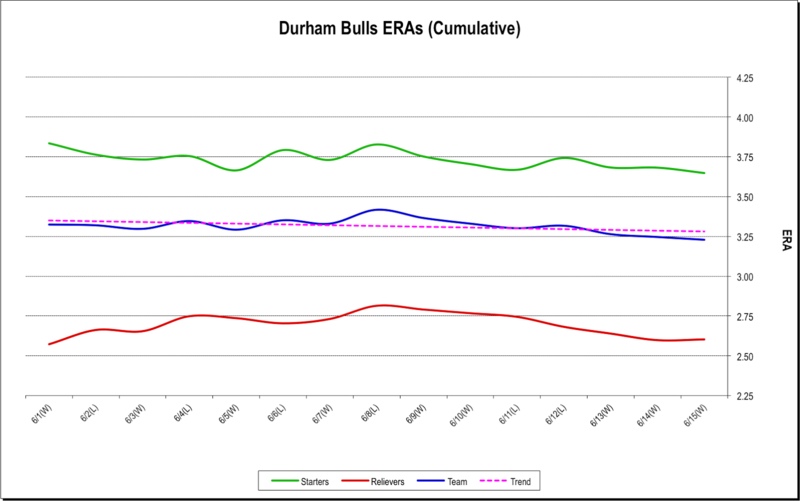 The team ERA (3.23) is the second-best in the International League, but that ERA of the relievers has got to be admired as a major component of the Bulls’ success. And then look at these WHIP (Walks, Hits, per Inning Pitched) numbers. 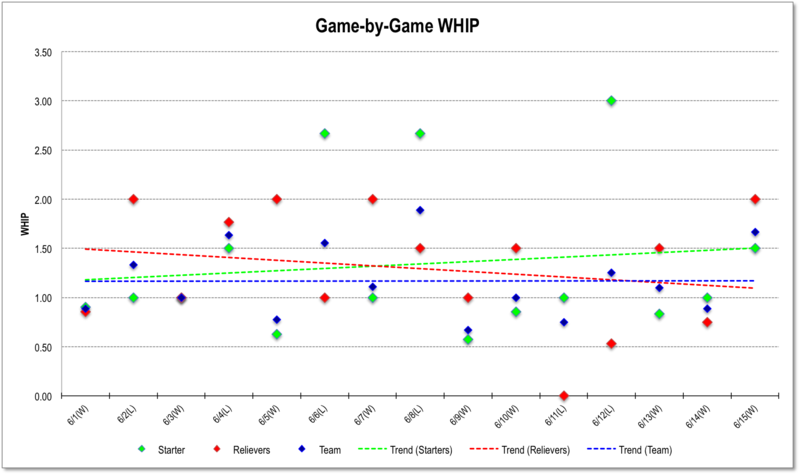 Unlike the last chart which is plotting cumulative numbers across the season, this shows WHIP game-by-game. What really matters are the trend lines. And I have to say that the trend of the team staying just above 1 is very impressive. The hitters are doing pretty darn good recently as well. 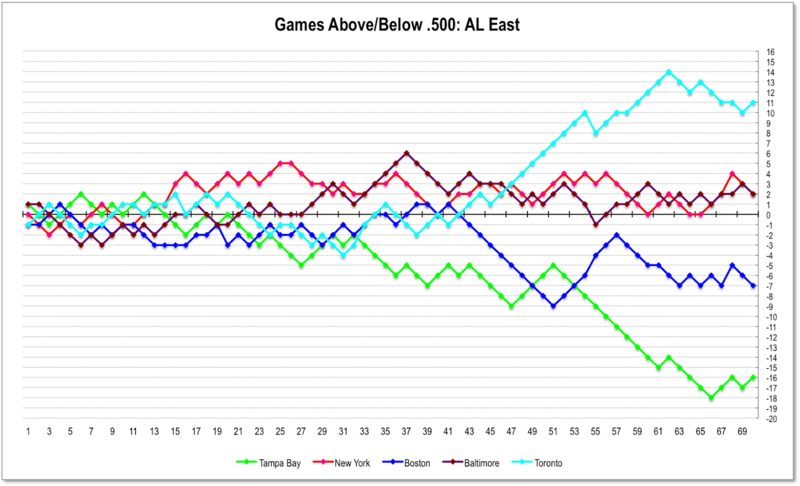 This is a game by game plot of the team OPSs at each of the last 15 games. Very nice. 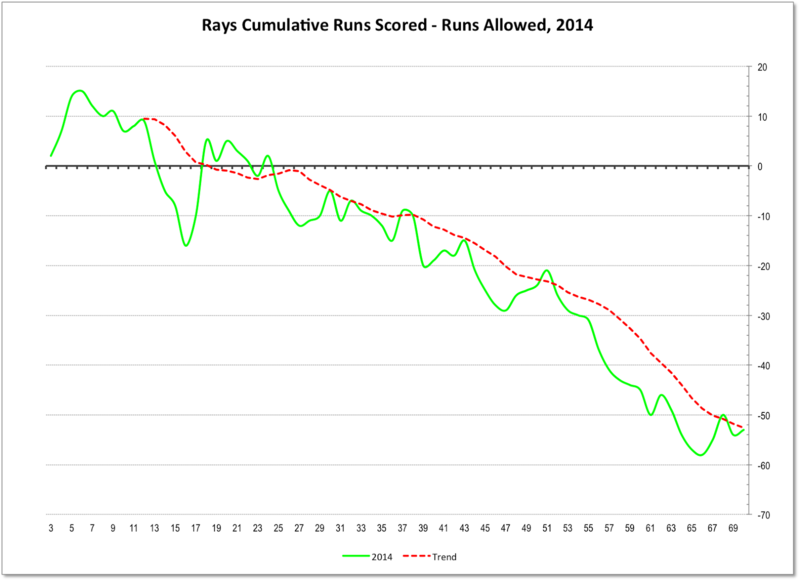 Since I have the data, I thought some folks might be interested in the equivalent Rays charts for at least their division of the AL and Runs Scored/Runs Allowed. They are at just 70 games in a much longer season. But it sure looks like they will have done well — very well, in fact — to reach .500 by the end of the year.